still, treat all guests honorably. Shortly after leaving Madagascar, I encountered this poem in a hostel. I stood in the stairwell, transfixed, as I read and reread the words that seemed to have been written just for me. Because a guest house is exactly what I’ve felt like over the past couple of months. There was sorrow, anxiety, and disbelief in my farewells. But there was excitement, satisfaction, and readiness as well. There was disillusionment, shock, and tension during my travels. But enthusiasm, clarity, eagerness, and serenity came too. There was confusion, judgment, frustration, and longing in my reentry. But they were accompanied by joy, comfort, and anticipation. All of these feelings (and more) continue to come and go. Some are completely unexpected. Some linger, while others move on in a flash. Some are easy to welcome, while others I would rather keep waiting at the door. At Easter, I wrote about how my YAGM year was challenging me to live into my emotions. To accept my feelings and welcome them all, pleasant or unpleasant, simple or complicated. My experiences this year have probably changed me in more ways than I’m aware of (yet), but a major area of growth is in my ability to serve as a gracious guest house host. I still have a lot of unresolved feelings about my year in Madagascar. I still have a lot of questions. And I still think that’s okay. 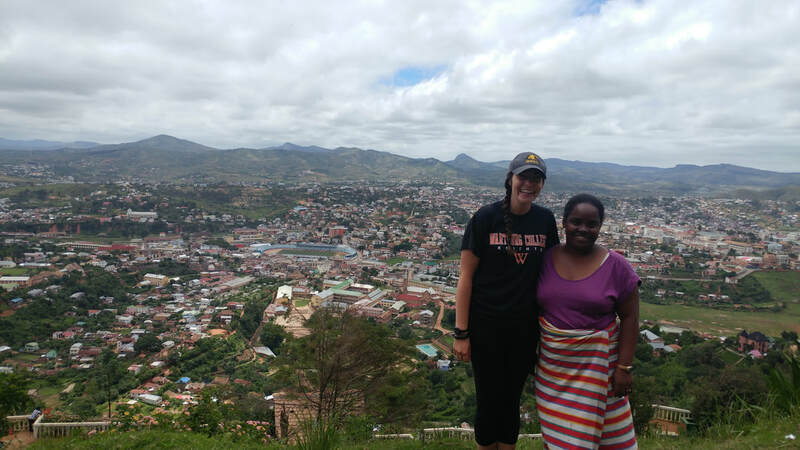 My journey didn’t end just because I left Madagascar; YAGM started a journey that will continue for the rest of my life, whether my path leads me to pursue a degree in ESL teaching or to serve abroad again or to go on a brand-new adventure. I ask for prayers for my time of transition to life in Minnesota. Prayers for my fellow YAGMs as they process their own reentries. Prayers for our sending communities who are now welcoming us all back home. Prayers for the new YAGM volunteers who are currently getting ready for their own deployment. 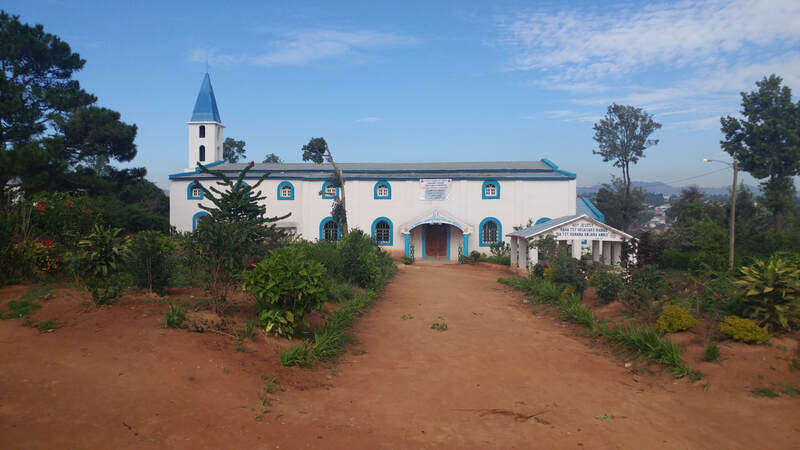 And prayers, as always, for my wonderful, loving community in Fianarantsoa, especially as they prepare to open their hearts and their homes to the next YAGM volunteer. Check out my final newsletter here. Thank you all for accompanying me on my journey this year, and stay tuned for upcoming posts about my re-entry into the U.S.! Almost every day this year, my host mom and I have risen with (or before) the sun and set off on a walk. Those hour-long excursions quickly became one of my absolute favorite activities, and I am going to miss our walks very much. Check out the slideshow below to see some of the beautiful scenery we get to enjoy every morning! Months ago, I accidentally bought a huge coil of bright orange rope. I only needed a few meters to make a clothesline, but, because of my poor language skills, I ended up with a thick wheel the size of my head. I remember thinking, “Great. I just spent way too much money on something I shouldn’t even have bought in the first place. What in the world am I supposed to do with all this rope?” I made my clothesline—which didn’t even make a dent in the amount of rope I had purchased. In the process, I managed to transform the perfect coil into a gigantic tangle of catastrophic proportions. For a couple of dedicated hours, I attempted to untangle the knots and rewrap the rope into a neat ball. Then frustration set in and I shoved the disappointingly small ball and the still-massive mess into a cabinet, slammed the door, and forgot about it. Last week, my host siblings came over after Sunday lunch, like they do every week. We were playing cards as usual when my two host sisters started talking about how they wished they had two long jump ropes to learn Double Dutch. Suddenly, I remembered the rope! We abandoned our card game, fished the tangle out of the cabinet, and got to work. We unknotted, stretched, measured, and cut the rope. Not satisfied with the thin jump ropes, we cut more rope, until only a ball the size of my fist remained of the once-enormous knot. We started braiding, like how the little girls in Tangled braided Rapunzel’s hair. It turned out that plaiting feet upon feet of rope was a very lengthy process, so we gave up on the second jump rope and ran outside with our completed creation. Every day, kids from all over the SALT campus gather in the packed-down dirt parking lot in front of my house and play for hours. Last Sunday was no different. Except that the jump rope brought together all the separate groups of kids and united them into one big group. The jump rope brought out the parents, who watched us play with laughter in their voices and smiles on their faces. I learned Malagasy jump rope games and taught some that I remembered from elementary school recess. We played until the stars came out and everyone got called home for dinner. I went inside feeling elated, sore, and determined not to banish the second jump rope to the cabinet. The first jump rope disappeared during the week, handed around between the neighbor kids and loved to the point that it looks months old now. I finished braiding the second one and waited eagerly for Sunday to arrive. Today’s church service ended early, and one of my host sisters and I rushed to my house to retrieve the new rope. Joined by my host brother and other sister, the four of us jumped and jumped and jumped until lunch was ready. After lunch there was no question about what our afternoon would be dedicated to: we were going to jump rope. We did figure out how to twirl the two ropes for Double Dutch but soon gave up in favor of our favorite games from last week. The jump rope worked its magic again. My host mom came and joined in, followed by my neighbor, whose kids I had played with last week. One of the pastors even made an appearance. Passerby stopped on the road to watch and laugh and smile and cheer alongside us. And when my host sisters went inside for a drink of water, we “grown-ups” stayed out to play. More kids joined us as the afternoon wore on, and even though our original Double Dutch plan was forgotten, two jump ropes turned out to be better than one. A posse of kids too little to jump grabbed the second rope and it found a new purpose as a limbo stick, high jump bar, and more. Nothing could stop us—until we collapsed from exhaustion, that is. Not shoes falling off midjump, change flying out of pockets, community members stopping to chat, feet growing dirtier by the second, nor little kids charging unexpectedly through the rope. I’m not sure where the jump ropes will travel this week, but I am convinced they will bring more joy and fellowship with them. And I already can’t wait for next Sunday. The bright orange rope isn’t so bright anymore. But it’s not sitting in my cupboard either. It’s funny how something so inconvenient can turn into something you wonder how you’ve gone so long without. It’s amazing how something as simple as a jump rope can bring a whole community together. I am so grateful for the day when I bought too much rope. I have 30 full days left in Fianar. That doesn’t seem like enough time. I’ll be honest: there have been times this year when I thought I’d never make it to the 30-day mark. There have been times when I’ve counted the days and counted again because I couldn’t believe there were so many left. There have been times when I’ve prayed time would speed up. And now I’m begging time to slow down. It’s difficult to imagine shopping in an air-conditioned, fluorescent-lit grocery store. Wearing pants instead of a skirt to church and to school. Seeing an actual toilet in a public bathroom. Understanding snatches of conversations when I pass by people. Going to church for only an hour every week. Brushing my teeth with tap water. Being able to be out after dark. Driving a car. Washing my clothes in a machine. It’s strange to think about going home—because I am home. It’s strange to think about things like freeways and Target and microwaves and parking lots and hot showers. So many things that I took for granted in the U.S. feel foreign now. It’s hard to believe that that “foreign” life is going to be my reality again in a little over a month. I don’t usually make countdowns. I don’t like to think about endings. But I think it’s important to be aware of how many minutes I have left in this amazing place with these incredible people so that I can make every last one count. “Tafika masina” translates to “holy war,” although it doesn’t mean marching into battle and forcibly converting people to a conquering faith. “Tafika masina” refers to any event during which people spread the good news. 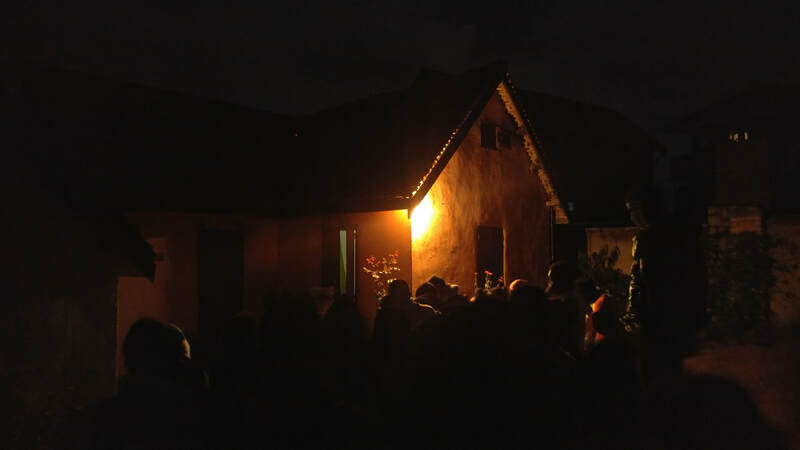 On the night before Easter, I gathered with members of my congregation outside our church. Armed with flashlights and hymnals, we set off into the night. Our mission? To spread the good news of Jesus’ resurrection at the homes of congregation members through song. In short, we were going Easter caroling. 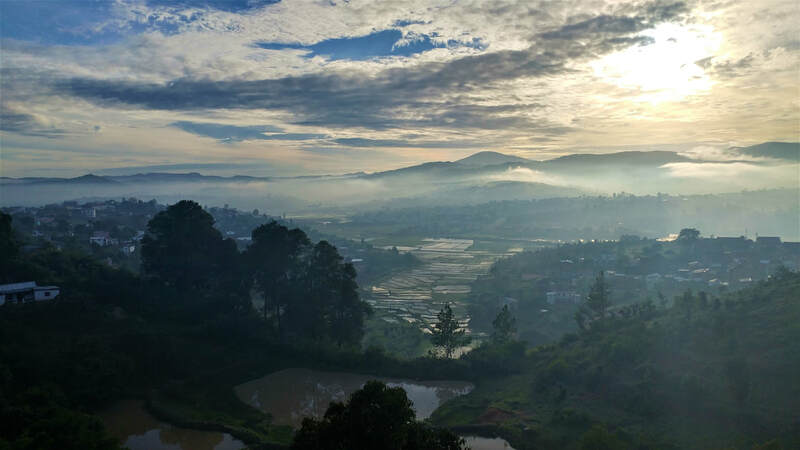 For three and a half hours, we trekked around Fianar, winding through neighborhoods, traipsing across rice fields, walking single-file down narrow paths, balancing on rickety bridges, and climbing steep staircases—all in the pitch-black night. As we walked, we sang. I definitely didn’t know most of the hymns we sang, but I belted out the words alongside my companions whenever I caught on to a familiar refrain. When we reached a congregation member’s home, we all gathered around the door, clicked on our flashlights, and flipped open our hymnals to number 133. (Well, at least I did. Everyone else already had the song memorized—and so did I by the end of the night!) Usually, we only sang the first two verses. But if the residents didn’t open a door or a window, we kept singing until they did. Once we had their attention and finished our song, we all shouted, “Velona Jesosy tompoko! Fiadanana ho an’ny tokatrano!” Jesus is risen! Peace be with you and your household! Most families offered a small gift for the church, such as a monetary donation or rice. And then off we went in search of the next house, singing all the way. ​There wasn’t any snow and it certainly wasn’t a silent night, but it was undeniably holy. Joy to the world because Jesus is risen! Gathering outside a congregation member's house. Read about my past couple of months here! My favorite church holiday is Good Friday, strange (and morbid) as that may seem. Why would Good Friday be anyone’s favorite church celebration? Why would anyone choose the day Jesus died over the day he rose or the day he was born? For me, the answer is simple: without Good Friday, there would be no Easter. I’m an optimist. I’m quick to point out the bright side of any situation, and I’m definitely not one to wallow in negative emotions. In fact, I usually do everything I can to avoid feeling anything close to sadness, anxiety, and fear. In the U.S., avoiding those feelings was easy because American culture thrives on distraction. There are endless stimulants available. All of the technology, sporting events, amusement parks, outdoor recreation areas, and malls make it possible for people to ignore and escape reality. Bored? Turn on the TV. Lonely? Talk to someone online. Stressed? Work out at the gym. Whenever I started to feel on edge, I would read, write, watch Netflix, hang out with friends, go for a bike ride, take a hike, surf social media, go to the movie theater, swim, play piano, go out to eat, wander around Target, drive, and more. Here in Madagascar, that inexhaustible range of distractions isn’t available. Of course, I can still read, write, watch movies, and walk around my city, but that’s about it. I live alone, so there’s not a roommate on hand to hang out with. I don’t have a consistent internet connection, so social media, Netflix, and the internet aren’t constantly available at my fingertips. There aren’t gyms, theaters, or department stores. I don’t have a car. Here, it is much more difficult to run away from reality. And for that, I am grateful. There have definitely been times in my seven months as a YAGM when I’ve felt anxious, stressed, lonely, bored, and upset. Instead of shirking away from those feelings, I’ve been trying to live into them. Leaning in, not leaning away. Being willing to experience the not-so-great emotions continues to challenge me, but I’ve noticed that being open to the reality of my feelings has made me appreciate life’s joys even more. I’ve been able to be more authentically present in my community because I’m starting to be authentically present with myself. I’ve learned that I can feel negative things and still remain optimistic—because I have faith that the darkness won’t last. ​We have to live into the hard times if we want to fully experience the beauty of the good times. And I think that’s what Good Friday is all about. We can’t just skip over the crucifixion and fast forward to Easter. If Jesus hadn’t died, he couldn’t have risen. And it’s because of the pain, the sorrow, the fear, and the despair that Easter Sunday is so miraculously wonderful. Good Friday serves as a reminder that life isn’t always full of sunshine. Sometimes, life can get pretty dark. Yet through the dark night, God promises that “the sun of righteousness will rise with healing in its rays.” The dark won’t last because the sun always rises again. Wherever you are, whatever “Good Friday” you’re going through, I pray that the healing sun rises for you this Easter. I pray that God resurrects you in the light of His hope. I pray that God gives you the strength to be present through the hard times and to keep your face turned to the rising sun. See this post and other reflections from me, a fellow Minnesota YAGM, and the St. Paul Area Synod on their blog. 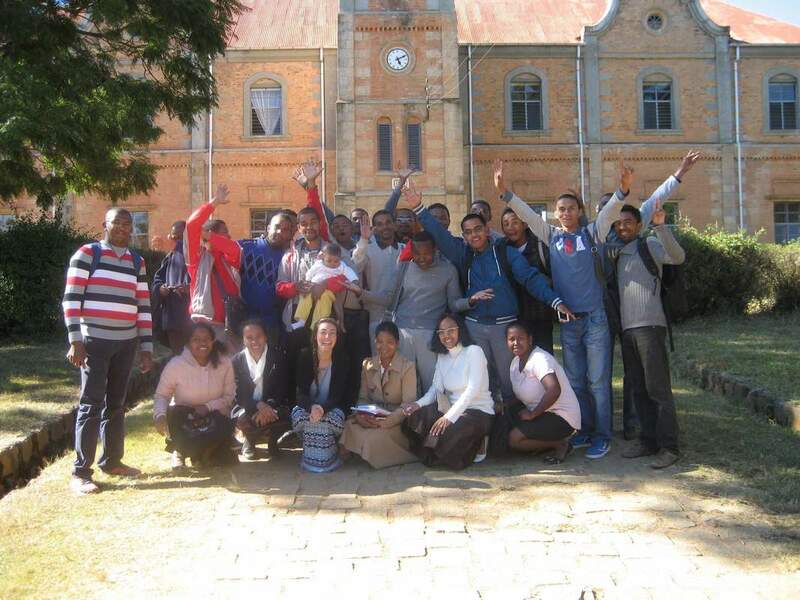 Check out the latest news from Madagascar here! ​​On Saturday mornings, I teach a community English course alongside my host mom and another woman from my church. Our students are a mix of congregation members, high schoolers, university students, and SALT students. We meet for two or three hours in one of the classrooms at SALT. The class just started a couple weeks ago, so we are all still getting to know one another! 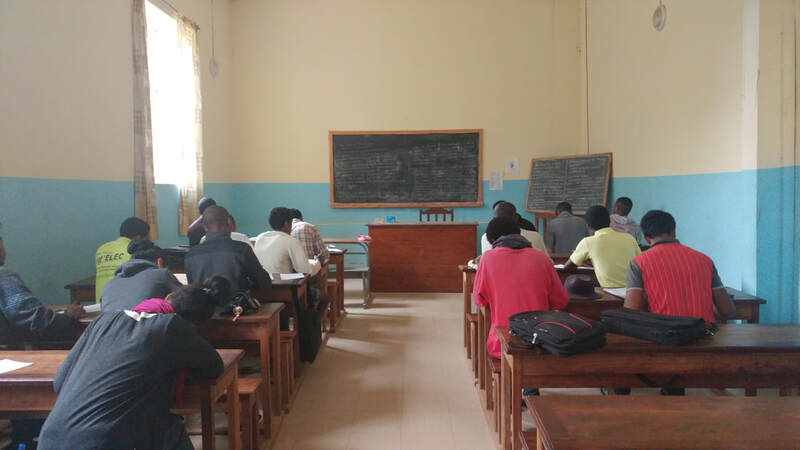 Students in our Saturday English course working on a pre-test in one of the classrooms at SALT. Krista, the other YAGM in Fianar, is a member of her church choir, and I have been lucky enough to attend a couple of her concerts! ​After class, I often have somewhere to be. My Saturdays have been full of listening to choir concerts; participating in cultural and language exchanges at my SALT co-teacher’s house; going on outings with my host family; visiting a nearby toby for special worship events to hear my host dad speak and teach; and, recently, attending Christmas and New Year’s celebrations hosted by different synods at SALT. (Yes, we are still celebrating Christmas and New Year’s here!) This Saturday, I’m traveling to Ranomafana with my host family and my neighbors, who are close family friends. Ranomafana is a national park approximately two hours from Fianar full of hiking trails and natural hot water pools. I can’t wait! Occasionally, my host family will come over on Saturday nights. We’ll make pizza together and transform my living room into a movie theater. Other weeks, just my three host siblings will come over to play cards. And other Saturdays, I have the night to myself. And then the week starts all over again with church on Sunday morning! My host mom, Germaine, and I at Point de Vue, an overlook that offers spectacular views of the city. A toby in Fianar. "Toby" is the name of a church-centered community where people with physical and emotional challenges live, are cared for, and receive spiritual care with church services every day of the week.